Starting tonight, New York’s Film Forum is running a series of crime movies based on source material written by women. 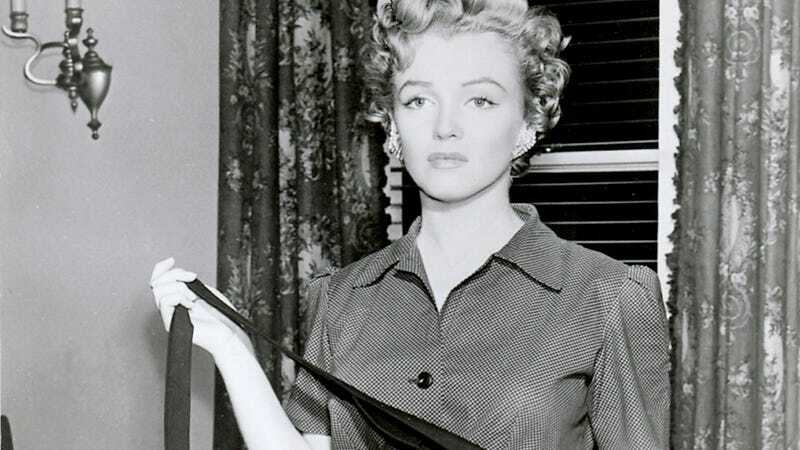 This is a great chance to catch Marilyn Monroe as a troubled, shady babysitter. Big city hotels—so sinister! Laura and Strangers on a Train are probably the most famous movies included, but the rest of the slate is interesting, as well. Don’t Bother to Knock features the aforementioned Monroe performance, and The Reckless Moment in particular is fascinating. In it, a young woman gets involved with a scummy older man and writes some incriminating letters. It wouldn’t be so bad except they quarrel, he falls and dies, and suddenly there’s a blackmailer trying to shake her mother down for $5000. And so a California housewife, Mrs. Harper, is sucked into dealings with the L.A. underworld while trying to cover her daughter’s tracks. I know that sounds like the premise for a half-assed Taken knockoff, but the movie is claustrophobic and stressful and very compelling. Made in 1949, you can already see the postwar frustration among American women bubbling up. It’s Christmas and Mr. Harper is off in Germany, building some bridge—on top of years spent away during the war. Mrs. Harper feels obligated to muddle through on her own. She tells her daughter not to worry and doesn’t make a peep to anyone else. Members of her family—her son, the daughter that got her into this mess, her father—are constantly pestering her for something, and by ten minutes in you’re feeling the strain so much their noise seems like fingernails down a chalkboard. The only one who recognizes her situation is the blackmailer, played by a weirdly reassuring James Mason. It’s noir with noir’s familiar beats, but covered in a woman’s fingerprints. (Which—back me up if you were also forced to read The Maltese Falcon in high school—is not universally the case in this particular genre.) There’s even an incredibly frustrating scene where a desperate Mrs. Harper rounds up her jewelry and attempts to get a loan, only to discover it’s essentially impossible without her husband’s cosign. If you’re New York-proximate, the series is worth checking out. Even if you can’t make it, it’s worth mining their picks for your own watch list. The series runs tonight through December 17.